Sad news to pass along tonight in the wake of an emotional City Game farewell to the Mellon Arena won by the Pitt Panthers in double overtime: an important member of the Pitt family has passed away. Serafino Dante "Foge" Fazio, a former Pitt football player and coach, has died at the age of 71 after a bout with cancer, confirmed by Pitt A.D. Steve Pederson at tonight's game. 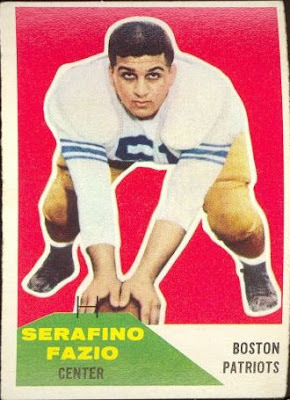 Fazio, a center and linebacker for the Panthers, was an All-East center and team MVP as a senior at Pitt in 1959. He was drafted by the Boston Patriots and played one season in the AFL before embarking on a career in coaching. Fazio returned to Pitt as the linebackers coach (1969-72; 1977-79), defensive coordinator (1979-81), and finally rising to head coach position in 1982, posting a 25-18-3 record in four seasons before being fired in November 1985, less than 24 hours after his fourth season ended with a 31-0 loss to Penn State and a 5-5-1 record. After his time at Pitt, Fazio then moved on to the University of Notre Dame to serve as the defensive coordinator under Lou Holtz. He also coached collegiately at Boston University, Harvard University and the University of Cincinnati in his career. Fazio's defensive mind translated well to the pro game, where he coached for the Atlanta Falcons and New York Jets before getting the Minnesota Vikings' defensive coordinator job under Dennis Green in 1995. He moved on in 1999 and coached the Washington Redskins' linebackers for a season before becoming the defensive coordinator of the Cleveland Browns in 2001 under Butch Davis. Fazio retired from the Browns in 2003 after their famous meltdown to the Steelers in the AFC playoffs, but resurfaced again in the NFL as a defensive consultant to Mike Tice in Minnesota in 2005, where he helped turn around a struggling Vikings defense. Fazio joined the Pitt football radio crew in 2008 as a color analyst, where he was teamed with Bill Hillgrove and Bill Fralic. He was as much of a Pitt lifer as you will ever see, and he will be missed by the Panther community. Very sad to hear. I knew he had cancer, and remember hearing him on some of the postgame interviews, but didn't realize he has been too sick to work recently. Listening to Billy break the news last night was heartbreaking. Hopefully the Panthers can pull one off in his memory saturday. He surely bled blue and gold. RIP Foge, a real Pittsburgher true and through. Now Adam will complain that there isnt a proactive obituary for Joe PA. Sad he’s gone. Certain deaths like this sort of put things in perspective and make you realize how short life really is. I met (sort of) Foge Fazio once in High School in 1985. I was the only one out walking the halls on a hall pass and Fazio came walking down the hall towards me. I knew who he was but I didn’t know what to say and we just stared at each other for a second, like he was going to ask me how to get to somewhere. It was weird. He was there recruiting players from my school no doubt.